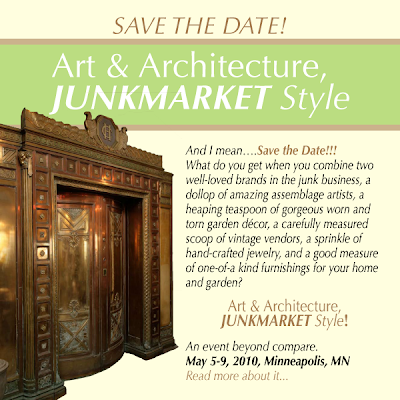 It is with great pleasure we announce the collaboration of Art & Architecture and JUNKMARKET Style in a retail affair of unrivaled quality. The inaugural sale of the dynamic duo is scheduled for May 6, 2010 through May 9, 2010. A charitable kick-off gala will be held on the evening of May 5, 2010. 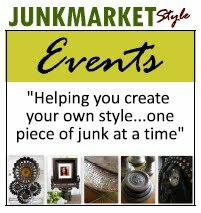 Our goal is to provide uncommonly good vintage furnishings, stylish art and re-designed accessories for your home, finery for your garden, and many other embellishments to suit your fancy….all under one roof. In addition, classes will be available for those of you who want to be in the know. The event will be housed in the historic Art & Architecture building located at 3338 University Avenue S.E, Minneapolis, Minnesota. 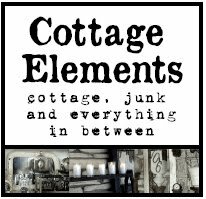 A full floor of architectural salvage, an outdoor garden annex, an artist’s loft filled to the brim, and classrooms with character all await your arrival. There will be something for everyone…. from stuff in the rough for the do-it yourselfers to turnkey designs and everything in between. Mark your calendars now and stay tuned to JMS for details as they unfold. This is an event you will not want to miss so spread the word! Hi Lanette! Sorry I haven't visited in a while. Hope all is well with you. This event sounds amazing! I will have to mark my calendar. Yep, Sarah! One in the same. Actually I think it was Robb Whittlef that was on it, but he wasn't the owner. It's a great place. Maybe we can even get Robb to join us :) Pk, good to hear from you. 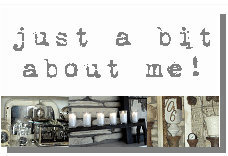 I've been such a bad blogger lately. Too much on my plate...I need to stop by yours...soon! Thanks for stopping by, too, Sarah. I need to check your blog out, too! Love your blog. Great info!!! I love those Lynette, what creative uses you came up with for them! The French Flea Sale and Tea Tasting! Putting a Little Light on the Subject! Winter Blues . . .